Integral counter sinks are designed within the countertop. 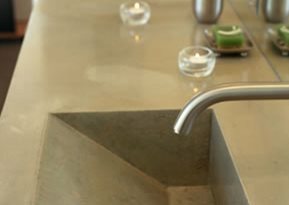 Creating a unified and consistent look, integral sinks are one-of-a-kind and meld basin with countertop. This fusion creates sleek and elegant tops providing ease of use in kitchens, bathrooms and other areas. 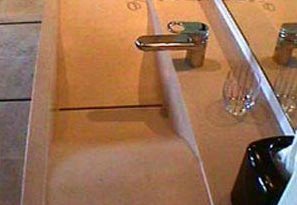 Integral sinks can be designed in variety of fashions. The possibilities are virtually endless. 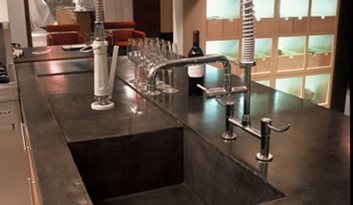 Many decorative concrete contractors offer their own individual artistic style of sink designs. Learn about the three types of concrete sinks: integral, pedestal, and vessel. Here are some other artistic designs of integral sinks. The Wave SinkThe wave sink features a concrete-formed wave between two or more faucets and is designed to lead all the water back to a pair of slot drains. The sink and counter essentially become one. The wave can be cast with a front apron and wall-mounted for a floating effect, or mounted on a standard height cabinet. Faucet holes are drilled to your specifications. Adapts to standard rough-in plumbing. The Ramp Counter SinkThis unique sink's basin is shaped like a ramp. Water flows down the ramp and disappears down the drain, sloped to either the end or the back of the sink. The geometric lines of the ramp sink make it a natural selection for a modern building or home. Trough SinksThese one-piece countersinks are designed to accommodate two to four faucets and are custom cast in your choice of colors. Many can fit on a conventional cabinet, or designed to "float" when supported by brackets on three walls.